I launched my Canada Friendly Giveaway newsletter back in April and have received lots of positive feedback. During the launch I gave a Keurig away and I thought it was time for another fun giveaway! 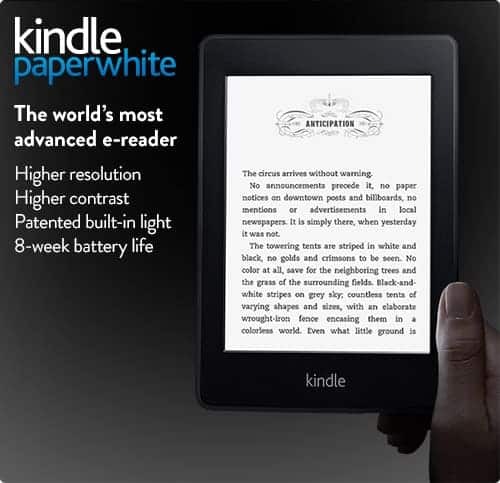 This time around I’m giving away a Kindle Paperwhite! Loved the May 28th Father’s Day quote: Any man can be a father. It takes someone special to be a Dad. My husband is step-father to my eldest daughter and this makes me think of him. She’s very lucky to have him. I never thought I could give up paper books but I do Love to use a Kindle! I’d love to try the Kindle as my Kobo is on it’s last legs, would be good to see the different technology! You have great photos of baked goods on your site. Love the photos of the baked goodies on your site. Wow, self-sponsored? Thanks for the chance to try to win! It’s a cool contest! Awesome e-Reader, thank you so much for sponsoring this giveaway!! What a cool piece of technology. Love reading book and leafing through pages and putting in bookmarks to mark my spot, but I want to try something new. Thanks for the chance! Thanks for a chance to win! Love your site.